Join Princess Vita as she embarks on a fantastical journey to rescue her kingdom! Once prosperous, the kingdom is frozen under a witch's evil spell. The King, the Prince, and many of their loyal subjects, are trapped inside the castle. To remove the curse and free your beloved land, you must race to find seven magic seals before the witch does! 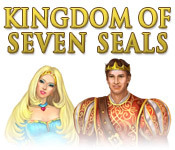 With the help of a friendly fairy and a cast of enchanted characters, save the Kingdom of Seven Seals in this exciting Hidden Object game! Kingdom of Seven Seals is rated 2.8 out of 5 by 12. 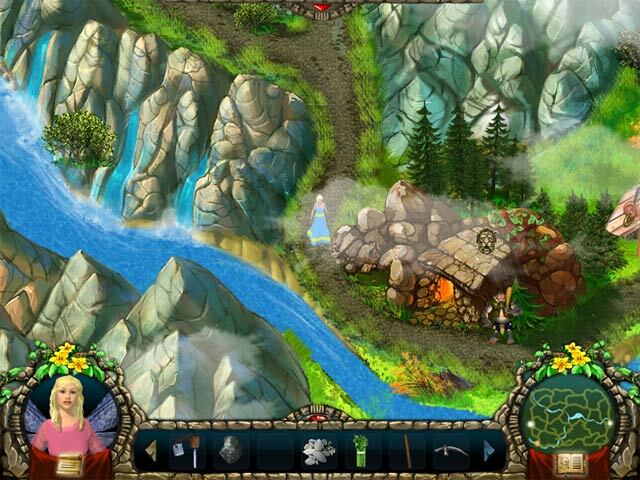 Rated 5 out of 5 by Bullionist from Fun Faery Tale Adventure I loved this game despite its occasional awkward moments. Generally it has a very fun and light atmosphere as you help the Princess on her quest to defeat the evil witch, and you get to travel around the map visiting different fairy tale characters and solving quests. The graphics are very well done and the characters are amusing. I liked the use of a 3rd-person map to travel around on, and fairly early on you can solve a quest and get the help of a Unicorn who will carry you from place to place much faster. You are also accompanied by a little faery who you can ask for hints to help you figure out what to do next. 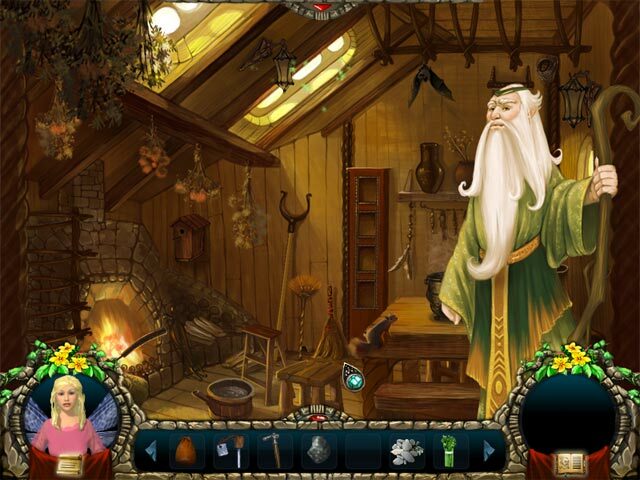 The gameplay is divided between nicely done hidden object scenes, travelling on the map, and a variety of fun little minigames (which can all be skipped on the easy difficulty setting). I played the easiest setting for this particular game, yet I still hit a dead-end a couple times and had no idea what to do next. However I found a free official PDF walkthrough available with pictures. The main problem I had was at the end when I couldn't get the solution to work the way it was supposed to according to the official walkthrough. I noticed several other people on forums had the same problem and some even wondered if there was a fatal bug. However, seemingly at random I did eventually get it to work and the mega-happy ending made up for the earlier frustration. Parental warning: while this game was cute and had lots of pretty scenes, the imagery in some scenes with the witch or the bewitched characters could frighten sensitive children-- especially when the witch leaps out at you near the end. (You can see a small version of what that looks like in the walkthrough.) Overall I loved this game and would like to find more games like it. And to be fair: Even the handful of confusing parts in this game were nowhere near as frustrating as the kind of puzzles game designers loved to foist on you in the classic PC adventure games (e.g., King's Quest). Rated 5 out of 5 by chiari_survivor from Great little adventure game, light on the hidden objects, well worth the $2.99 sale price! Kingdom of Seven Seals by Big Fish Games and Puppet Life. My review is based on my completion of the game played on the hardest setting (since I failed to check the options before starting my game). Princess Vita must run all over the kingdom to 17 homes of the fairy tale type citizens including fairies, ogre, mermaids, trolls and druids just to name a few, doing favors for the citizens so that she can get the 7 seals and restore the kingdom and not only save the royal family but also the children of the citizens that the witch took hostage also. This game is more adventure than HOG. I found it a fun game that I was able to play with my grandson minus the slot machines used to earn money to bribe the witches "goons" or robbers. Though if VERY VERY careful (plus very observant- to get an extra misc item on the road side) you could possibly...maybe... get through without visiting the slot machines but it would be difficult! The game loads pre set to the hardest setting. There are differences in the game dialog and screen set up depending on the level of difficulty that you choose. There are things that were intentionally left out to make the harder levels more difficult, which explains the frustration that many players expressed on the forum pages and the lack of instructions. The options page has a slider settings for 3 levels of difficulty, 10 levels for the music and 10 levels for the sound effects. They also had boxes to check to mute all, full screen and custom cursor. There are spaces for up to 5 players. You have a fairy who is your helper through a majority of the game. She offers little help on the most difficult level. She is located on the lower left. In front of her is a scroll of paper that will return you to the main menu. There is a button on the lower right that once pushed will show a small map of the kingdom and remains on there after. The white dot is your current location and the gold dots are locations with active tasks to accomplish. It would have been even more helpful if the map had transported you to the location, but at least your current movement was shown, which was very helpful as you are continually criss crossing the whole kingdom. Under the map in the lower right is a book or journal that looks like a scroll. It includes 3 tabs, first is a task list that checks off the items as you complete them, then a short history of the kingdom and finally a map with each characters name listed. If you mouse over the house a picture of each occupant will appear. There are also signs outside each house with their pictures also. The map shows the roads, rivers and homes in the kingdom plus the 3 slot machine homes to earn more money if needed for the highway robbers. The slot machine can be played for as long as you desire and each of the 3 money houses are the same. The inventory for most of the items is located at the bottom of the screen except the seven seals, which are located at the top of the screen. Between the book and the fairy helper, the game still tends to hold your hand rather tightly as most tasks must be done in a certain order to progress. The conversations are important to read so you will know which home you need to travel to and what you must do. Sometimes you are given multiple steps to be done. Each scene seemed to have an adventure type task, a small HOG scene of 8-12 items for the hardest level with a few less on the easier levels and then a few also had a puzzle type game. Few instructions were given on the hardest setting but were not too difficult to figure out. Here again the games were slightly altered depending on the difficulty level you choose. Items do vary when additional profiles are added. As the princess is traveling be sure to have her pick up any jewels, gold or misc items as all items will be of use at some point. 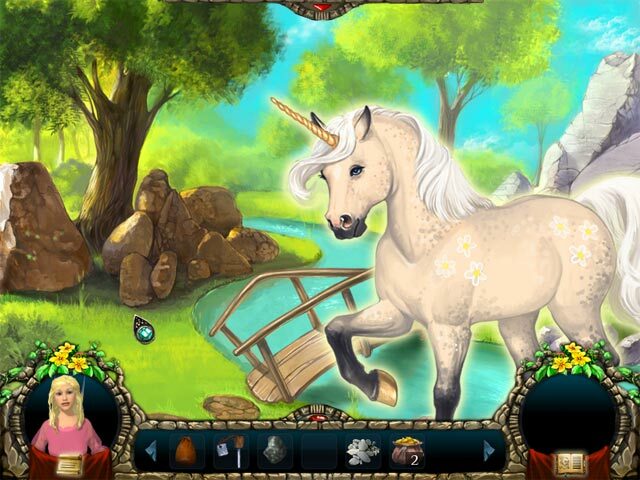 Misc items were not explained in the game but the producers of Puppet Life responded in the forums and explained the skill that each item provided the princess or unicorn with, plus they answered many questions of where to go and what to do type of questions. Kudos should be given for their customer service as not too many developers come in and answer questions and take the critical comments along with the positive. Their forum posts gave many spoilers so be forewarned if you read them. Once the princess is within a few steps of an item the cursor will turn to a hand to retrieve the item. The book is very helpful when you get stuck as it tells you the task that you need to do. The game allows you to go where you want to go therefore you may finish certain tasks before the developers had planned for a scene to be done. There fore it is understandable that you will be told that "there is nothing for you to do here" when you go searching through homes when you missed where you were told to go in a conversation or you just plain forgot between your gaming sessions. In closing this was a great little adventure game light on the hidden object's and well worth the $2.99 on sale or as the Daily Deal or Game of the Week. Rated 4 out of 5 by Rescue_helo from A charming story An enchanting little fairy tale ideal for children and younger players set in a colorful fancy world inhabited by fairies, druids, unicorns and other legendary creatures. It is not exactly a HOG even though there are a few HO Scenes with 4 or 5 items to find in each, but rather an adventure in which you interact with the different characters. You lead the princess in 3rd person view through the world so that she can perform the tasks that are given in the diary. A map helps you find your bearings. Tasks, minigames and interactivity are easy but good fun. The game is linear and you can set the level of difficulty in the Options. Hints are given by a lovely little fairy and serve primarily to spot the hidden objects. The graphics are nice, uncomplicated, full of lively colors, the challenge level is moderate and the music isn't bad at all. Cute and refreshing, this adventure should ravish your progeny by its simplicity. Rated 3 out of 5 by andreakysor from This game left much to be desired I bought this game as the $2.99 game of the day and I am glad I did not pay full price. This game is not terrible but it is not good either. Here is what I liked about this game... The story was decent for a fairy tale / fantasy story. I liked the way your character traveled throughout the kingdom (one exception is the lack of screen scrolling when you reached the edge of the screen). SOME of the characters were interesting. Here is what I did not like. This game was too easy and it is set to the highest difficulty by default. The graphics were strange and very cheesy (What's up with the elf and the "good" witch? They look like they were dressed by Punky Brewster.) There was no cohesiveness to the game as a whole. It just seemed like a bunch of different mini games smashed together with out a lot of thought for the finished product. Seriously there had to be a better way to earn gold for your quest than having random "casinos" placed throughout the land... and it was strange that there were modern day devices (flaslights, fuses, etc) in the hidden object areas. Anyway this game is just OK. I did kinda enjoy playing it, I just had to turn my brain off. Rated 3 out of 5 by KITANA716 from Kingdom of Seven Seals The graphics of this game was poor quality they've could've clean those graphics up make them brighter and cleaner, plus it has a glitch which hurts the rating for this game.The sounds ...meh! Storyline so far is fairytale for children.I'm sure that a youngster would appreciate this game.But definitely this game is not for adults. Rated 2 out of 5 by arnold1049 from MAYBE YOU NEED TO BE A KID This game was frustrating to me as it was not intuitive. Several times I could not figure out what to do next. I did find a walkthrough on the internet, but that wasn't all that much help. I hardly ever give up on a game; I always try to tough it out and finish it, but this one was just too irritating. Rated 2 out of 5 by Heather_G from Non-standard, glitchy adventure with a few HOS. This was a strange one. Yes, the storyline is better suited to children, especially little girls who are into princesses. It is more adventure than HO, but I'm an avid adventure gamer so am used to games that don't give much indication as to what to do next. That said, this game has some big holes in it. There are puzzles without reasonable explanation--as in one that never offered key information and had to be solved by trial and error. I played on the hardest setting (there are three). You do all of your movement on a map, basically--an overhead view of the area with little detail. Only when you reach a location you can enter do you get a better view of the room from eye level. Sparkles tell you where the doors are, and often are the only indication that a "door" exists because they are frequently on windows, a painting, or just some spot on the wall. Hints are not always very helpful, sometimes conflicting with what the characters wanted my to do, and I had a rough time figuring out where to go and what to do next. My PC easily met the game's requirements, but locked up three different times, requiring a three-finger-salute to get out and restart the game. I also agree with other reviewers about the grainy quality of the graphics. It's only a problem in the few hidden object scenes, but there were plenty of items that I could not see against the background because they were small, and colored/textured just like what was behind it. If you're interested in trying an adventure game, this is NOT a good introduction to the genre even for a crossover. I can't say I recommend this game. Rated 2 out of 5 by ladycholla from Jumping Cursor Could not get a decent time for this game, my cursor wouldn't quit jumping all over. I wouldn't move smoothly. Could have been fun for a child if the cursor would work. Bright and colorful, with lots of fun characters. The kingdom suffers under an evil witch's curse! Help Princess Vita unravel her land's mysteries and liberate the kingdom!